Water rushes from a high point to a low point. A dam or natural incline of a waterfall can create those high and low points. As the water falls, it forces the blades of a turbine to spin. The action of the turbine converts the falling water’s energy into a mechanical form of energy. Generators that are connected to the turbines take that mechanical energy and convert it into electricity. Power lines send the electricity from the generators to homes and businesses. There’s one more aspect to this that’s essential to proper operations. The water entering the turbine can’t be filled with trash. The EPA believes around 80 percent of the trash found on beaches came from the land. Much of it is food packaging and beverage cans and bottles. When that trash and recycling finds its way into rivers and into hydroelectric power stations, it can damage equipment and impede water flow. Is That Much Trash Really in Our Waterways? The amount of trash and debris in rivers is astounding. In 2010, the Great Mississippi River Cleanup began. In less than a decade, volunteers have already removed more than 513,000 pounds of trash and recycling from the river. Each year, Riverkeeper Sweep volunteers clean up trash from the shores of the Hudson River in New York. In 2018, 38 tons of trash was removed. Where does all this trash come from? Trash may fly out of a truck bed when it’s not secured. Some flies out of open car windows on a gusty day. It can be deliberately tossed out. People may not properly dispose of food packages after a picnic. Wind can blow it from recycling containers and dumpsters that are not closed. To prevent this from happening, consumers need to be careful about disposing items and reusing packaging as much as possible. You also have the debris that naturally ends up in waterways. An old tree on the bank of a river may fall in after a storm. Branches may snap off trees after an ice storm and end up in a river. Leaves that fall off the trees in the fall will end up in some of the nation’s rivers. That debris is biodegradable, but it can clog the screens on water intake pipes at hydroelectric plants and cause problems. How Do Hydroelectric Plants Keep the Trash Out? There are two components to trash and debris removal at a hydropower station. Trash or bar racks are metal screens placed over a water intake pipe. These metal grids prevent things like fallen branches, trash, and recyclable containers from going into the pipe connected to a turbine. Those screens need to be cleared from time to time. That’s the job of a hydropower trash rake. The rake removes the debris and trash from the screen automatically. This keeps the screen clear so that operations are not impeded. If the screen is not cleaned, air bubbles can get in and damage the turbine. Low water pressure is all it takes for the air bubbles to form It could be from a blocked screen or low water levels in a river or reservoir. To prevent pockmarks in the turbine blades and the vibrations that can come with it, the plant must shut down and wait until water flow is corrected. This can cause power outages for people served by that plant. Hydropower trash rakes can work quickly. Catronic Series Trash Rakes clear a 200-foot section at depths of up to 100 feet. The ability to lift up to 20 tons makes it a powerful system for removing fallen trees from trash racks. The hydropower trash rake can work automatically or with someone operating the system and manually removing logs, trash, and other forms of debris. 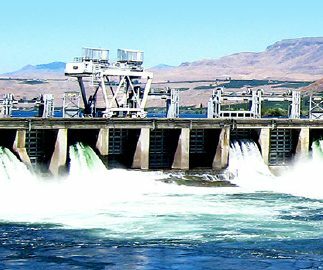 What does your hydroelectric power station need to keep equipment in prime condition and working efficiently? The professionals at Lakeside Equipment Corporation can help you find the perfect solution. Call 630-837-5640 or email sales@lakeside-equipment.com for more information. When the Clean Water Act took effect in 1972, regulations came into play that kept untreated wastewater out of streams, rivers, lakes, seas, and oceans. Why was this necessary? Prior to the act, some rivers in the U.S. were so polluted that they were deemed unsafe for recreational activities like swimming or fishing. Contaminated water led to toxins in the fish people ate. That’s why there are limits on how much seafood you can safely consume today. Plus, it was changing the water sources. Harmful bacteria and algae thrive in some polluted bodies of water. Today, wastewater treatment plants must hold Clean Water Act permits. Before any wastewater returns to a body of water, it must be cleaned. This includes water that goes into a city’s storm drains, water from sewers, and water that’s trucked in by companies that pump out residential septic tanks. While the Clean Water Act wasn’t enacted until 1972, it actually dates back to the 1940s. The Federal Water Pollution Control Act put standards in place to help improve the quality of water sources like rivers, lakes, and oceans. It was completely revised and renamed in 1972 and became officially known as the Clean Water Act. The basis of that act was to make it illegal to discharge any wastewater from a “point source” (container, drainage ditch, pipe, tunnel, etc.) into a water source without a permit. This included manufacturers, waste treatment plants, cities, and towns. The National Pollutant Discharge Elimination System (NPDES) permit goes to companies who have the technology and procedures in place to limit bacteria and other pollutants from water that is discharged. To ensure companies are following the guidelines, random samples are taken from time to time and tested. These permits last five years. Despite the changes over the years, many bodies of water in the U.S. still deal with pollution. From 1990 to 1994, the Environmental Working Group reports that the Mississippi River had more than 702 million pounds of toxic materials released into the river. More than 35 million pounds were released into the Pacific Ocean from three of the West Coast states. The Ohio River was next with more than 22 million pounds. It’s clear there is still work to be done. Many decades ago, mixing raw sewage into a water source was an effective way to purify that wastewater. The bacteria and creatures in the water would eat the organic matter. As the population increased, there was too much waste for this process to be effective. That’s why water treatment plants developed. The first stage in a water treatment process involves separating large items like paper, sticks, and plastic items from the liquid. Screens capture the larger items and allow the remaining wastewater through to the next stage. Trash rakes remove those items from the screens to prevent clogs. Wastewater goes into a grit removal system to separate the smaller particles like sand and small stones and aerate the remaining wastewater. After grit is removed, the wastewater goes to a sedimentation tank to help further remove sediment. It goes through a filter and is aerated more with waste falling to the bottom and the aerated water going out through the effluent pipe. Eventually, chlorine is added to kill any remaining bacteria. Depending on state laws, the chlorine may need to be removed prior to going back into a water source. For 90 years, Lakeside Equipment Corporation has specialized in water purification systems. The companies original goal was to ensure people had safe drinking water in their cities and towns. Since then, expansion has led to water and wastewater treatment solutions in all of North America and many other countries around the globe. What are your water treatment goals? Call us at 630-837-5640 to talk to a specialist about water treatment solutions that fit your budget and needs. Since government water quality standards were required, water is nothing like your ancestors experienced. Still, there are improvements that can be made. Using data and technology, wastewater treatment engineers continue to make strides to ensure that people throughout the world have clean, safe water. Civilizations like Ancient Greece, Ancient Egypt, and Mesopotamia all strived to dispose of human waste to keep water sources clean. In the United States, Hans Christopher Christiansen helped launch the nation’s first public water department in Pennsylvania in 1755. Baltimore, Maryland, and Boston, Massachusetts, were the first two cities to create municipal water treatment plants. Diseases like cholera were running rampant. These did not come into fruition until the mid-1800s. It wasn’t until the 1910s that chlorine was used to sanitize water. World War II led to new discoveries on treating water to make it clean and safe. Surprisingly, despite the advancements, the U.S. government did not pass the Safe Drinking Water Act until 1974. At this point, tests were used to make sure the levels of certain contaminants were monitored and maintained. Wastewater is the water that travels through sewers or is trucked in after septic tank cleanings. It comes from washing machines, dishwashers, sinks, bathtubs, showers, and toilets. In a sewer, it also contains water that drains from streets on a rainy day or when the snow melts. Wastewater contains everything from soap and cleaners to food scraps and human waste. It can be the water that comes from an industrial setting like a paper mill or manufacturing plant. For this water to be reused or returned to lakes and streams, it needs to be filtered and cleaned. Cleaning wastewater requires multiple steps. First, the solids need to be filtered out. The remaining water, known as effluent, continues going through smaller and smaller screens that keep filtering the grit. That grit is disposed of in landfills and other facilities that can process it. Aeration adds oxygen that can help break down gases and assist materials in the effluent as they decompose. This secondary step continues to help get rid of grit and other materials. The third step is to help separate the sludge and scum from the wastewater. Sludge settles at the bottom is moved to digesters. Scum, such as oils and plastic materials, float to the top of the tank where mechanical rakes remove them. Filtration is a fourth step that helps remove bacteria by running the wastewater through sand or carbon filters. In addition to removing bacteria from the water, iron is also removed. In the final step, the filtered water is moved to tanks where chlorine helps kill off any remaining bacteria. As the chlorine destroys remaining bacteria, it also breaks down leaving minute traces of the chemical. At this point, it’s ready to enter rivers and become part of a natural water source again. How Do Data and Technology Help? Computers have become an important component in wastewater treatment. Not only do they help with research and data, but they also run the CAD software that can help design the right system for your needs. Once the blueprints are in place, you’ll be able to pick the equipment you need. 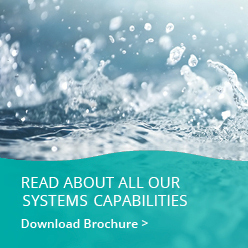 Field engineers have the training and hands-on experience to make sure installations of entire systems go smoothly. If there are hiccups, the engineers are on-hand to figure out and implement a solution. The EPA maintains the Industrial Wastewater Treatment Technology Database to make it easy to find Clean Water Act rules and guidelines. This resource helps make it easy to research the latest advancements, which can help companies hone their wastewater practices. You can search by topic, industry, pollutant, technology, or download the entire database. Technology alone has led to many advancements in productivity and operational costs. Wastewater treatment systems of the past relied on humans to manage many of the controls and processes. While today’s computers can adjust the flow rate of wastewater and clean screens, humans once had to carefully monitor and manage those aspects. Motorized rake systems remove oils, plastics, and other trash now, but humans used to have to rake these materials out. Screens are cleaned automatically. Computers can take readings, store them for management to use, and this makes it easier to manage overall costs and expenses. 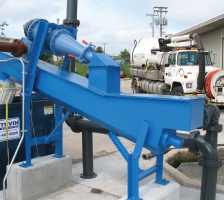 Lakeside Equipment has been helping with wastewater treatment since 1928. Engineers and other wastewater specialists work with companies to create effective water treatment systems. The company can keep operating costs down and ease maintenance and repair requirements. Complete the online form to talk to a customer service representative. Your business and the machines within it are only as good as the people who work alongside them. That’s why when you’re looking to invest in a project that requires an industrial screw pump and a partnership with its manufacturers, you want to ensure that you’re working with a company whose goals align with yours. A screw pump made by a reliable and trustworthy company will make your project easier from start to finish and beyond. All you need to know is precisely what you’re looking for in a partner company and how to find it. Don’t be intimidated by the specificity of your need for a screw pump! No matter what the need, a potential business partner is a potential business partner, and partners of all stripes deserve the same basic research and respect. Before you start choosing which industrial screw pump manufacturer you want to work with, you’ll need to perform a needs assessment in order to better understand what you’ll require of a partner and of your screw pump. Consider, of course, the screw pump’s function. Industrial screw pumps are used to move large amounts of water and other liquids from one area to another, thereby making it simpler for debris and the like to pass more easily through the system with which it is affiliated. The screw pump, then, prevents damage to the delicate parts by effectively separating reusable fluid from any solids that may have been included in the mix, be that inclusion intentional or otherwise. Screw pumps are most frequently affiliated with water treatment plants, but they can also be used on a day to day basis in more engineering-oriented as well. As such, look for a manufacturer who specializes in the applications which most closely apply to your needs. While the modern age of technology has made it simpler to work with companies all over the world, you may still, when looking for a screw pump manufacturer, want to work with a company based a little closer to home. The installation of a screw pump inside your plant or business will require the attention and effort of dozens of outside employees, and if you’re working with a manufacturer who is located nearby or at a minimum offers service in your area, you’ll be able to meet these employees beforehand to ensure it is a good match. If you’re feeling braver and find a manufacturer whose goals align with your own, even though they’re located a significant distance away, do what you can to try and meet with critical implementation team members in person. You’ll want to do what you can to treat your new screw pump partner like any other business partner. Communication and time spent face to face is key. It’s important to consider the reputation of your new partner alongside their location. If you find that local manufacturers are nearby but less than stellar in their work or product offerings, it’s natural that you may want to broaden your range. When searching for potential screw pump manufacturers don’t be afraid to ask a company representative about the previous projects they’ve worked on. Experience and reputation go hand in hand, and it’s especially important that your new partner makes good on both. Having touched on communication already as a part of a partner’s location, it makes sense that the ability to frequently get in touch with a potential manufacturer would be important. There’s more to communication than that, though. When asking yourself, “What should I look for in a screw pump manufacturer,” you’ll want to ensure that you consider your potential partner’s ability to stay in touch with you. This means that an ideal screw pump manufacturer would not only get in touch while your screw pump was being installed, but that they would remain accessible after installation and offer on-going support and maintenance when needed. Speaking of expectations: you’ll naturally want to have developed a schedule for yourself and your company by the time you start looking for a screw pump manufacturer to partner with. In your first meetings with a potential partner, it’s important to ensure that your workable schedules align. You will want to consider the time it’ll take your potential partner to meet your needs for a screw pump. Outside of this, however, it’s important that your expectations of your partner’s ability to work and keep to a deadline are reasonable, and that their expectations of you are equally based in reality. Most importantly is your budget. When you start looking for a screw pump manufacturer to partner with, you’ll want a range of prices in mind so you can both pay your partner fairly and negotiate costs so that you remain in the black. Do your research. Find the screw pump manufacturers who work within your desired range and reach out to them to gather quotes regarding how expensive a partnership between the two of you may be. Like all business partnerships, while price is important, make sure you are comparing apples to apples. Experience and reputation often come at a premium. Though their purpose may be complex, screw pump manufacturers are like any other manufacturer or business partner who you might start a partnership with. Make sure that your goals align, that your schedules remain flexible, and that you communicate with one another, and you’re likely to have the screw pump you need with little to no hassle! According to the Environmental Protection Agency (EPA), wastewater treatment is one of the most common forms of pollution control in the U.S. Lakeside Equipment Corporation is proud to supply equipment and systems that are used across the country at wastewater treatment plants, which are facilities that clean wastewater before discharging it back into the environment. Wastewater treatment plants were not always necessary. In the past, bacteria and other organisms found in waterways would break down sewage into harmless byproducts in a naturally occurring purification process. But, the bacteria and other organisms could not keep up with the increase in population and production of sewage. Wastewater is now sent to wastewater treatment plants—many of which use the same purification process found in nature to clean water. Most wastewater treatment plants prepare wastewater for reuse in two separate stages: the primary and secondary stage. Sewage enters the primary stage of treatment as soon as it arrives at a wastewater treatment facility. First, it is sent through a screen that is designed to remove large pieces of debris that could damage Lakeside equipment used elsewhere in the facility. Some facilities have multiple screens in place to remove objects and materials of different sizes from the sewage. After passing through the screen, the sewage water moves into the grit chamber. Grit can include sand, gravel, eggshells, or any other type of solid material that makes it through the screening process. There are several different types of grit chambers, but Lakeside’s aerated grit chamber is among the most popular. The wastewater flows in a spiral pattern inside this chamber. Air is slowly introduced into one side of the chamber, creating a perpendicular pattern that separates heavier materials from the rest of the water. The heavier materials, or grit, then sink to the bottom of the chamber. Even though the wastewater has been through screens and a grit chamber, it still contains other materials that need to be removed. The wastewater slowly flows through a sedimentation tank, and as it flows, the solids that remain in the water start to drift towards the bottom of the tank. This is the final step in the primary stage of the wastewater treatment process. At this point, the majority of the solids have been removed from the water. But, the water is still not clean enough to be released back into the environment, so it enters the secondary stage so it can be purified even further. The secondary stage of the treatment process is designed to remove up to 85% of organic matter that remains in the wastewater. There are a number of different ways to achieve this goal, but many facilities use either the trickling filter or activated sludge process. If the facility uses the trickling filter method, the wastewater is pumped into an area that contains between three to six feet of stones after leaving the sedimentation tank. Bacteria and other small organisms grow on these stones, so they consume or break down the organic matter in the water as it flows through the tank. The water is then removed from the trickling filter through pipes and sent back to a sedimentation tank for yet another round of purification. Most facilities use the activated sludge process, which takes place immediately following the sedimentation tank in the primary stage of treatment. The wastewater enters an aeration tank, where it is mixed with sludge. Air is then pumped into the aeration tank to facilitate the growth of bacteria and other small organisms within the sludge. The bacteria and other microorganisms break down the organic matter in the water into harmless byproducts. The wastewater will remain in the aeration tank for between three to six hours, which gives the bacteria and microorganisms plenty of time to break down all of the remaining organic material. After leaving the aeration tank, the wastewater is usually sent to another sedimentation tank to separate the solids from the water. Regardless of which method is used, the wastewater will go through one more round of treatment before it is released back into the environment. After the water leaves the sedimentation tank in the secondary stage of the treatment process, it is sent into tanks where it is exposed to chlorine. Wastewater typically spends between 15-20 minutes inside these tanks with chlorine. This chemical kills the harmful bacteria that could be lurking in the water, and it also gets rid of the unpleasant smell of wastewater. Wastewater treatment plants can kill up to 99% of bacteria in water with chlorine, so this is an important step in the process. Some facilities do not use chlorine to kill bacteria in the final stage of the treatment process. Instead, these facilities use alternatives such as ultraviolet (UV) light or ozone to kill bacteria in the water before releasing it to the environment. These alternatives do not involve the use of chemicals, so they are considered safer for the environment and wildlife. After the water is sent through this final stage, it is released into waterways in the community. The final stage ensures that the vast majority of bacteria in the water is killed so it will not harm humans, animals, or the environment once it has been discharged. Treating wastewater is a complex process that involves the use of high-tech and reliable equipment. Lakeside is proud to supply the equipment and purification systems that wastewater treatment plants need to filter, clean, and disinfect water before it is sent back into local waterways. If you are interested in purchasing Lakeside equipment or systems, speak to one of our representatives today by calling 630-837-5640.